NO COASTING! 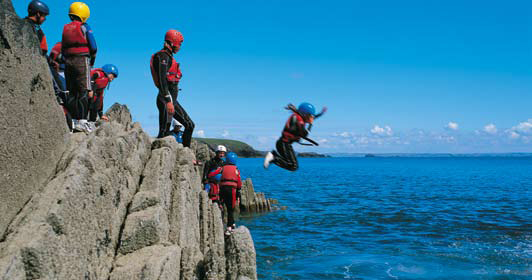 Coasteering is one of the fastest growing adventures sports in the UK, and Wales its most popular place for it! This watery activity is a full-on adrenalin experience guaranteed to get the blood flowing and the heart pumping. Swimming, jumping, diving, climbing and scrambling are all part of Coasteering, giving you a new perspective on the features marking the boundary between land and sea. Wales boasts mile upon mile of stunning, natural, unspoilt coastline, hidden coves and award winning beaches. So if you have the desire to try just one watersport in Wales, it has to be Coasteering.